A 2009 inventory found a total of 127 MPAs in Washington, of which 16% were no-take areas in which all resource harvest is prohibited. In addition to areas restricting harvest, some MPAs involve habitat protections or restrict non-harvest activities such as vessel anchoring or recreational access (Van Cleve et al. 2009). There are 110 officially designated MPAs in Puget Sound (366,503 acres and almost 600 miles of shoreline) of which 24 are within the national MPA system (Osterberg 2012). 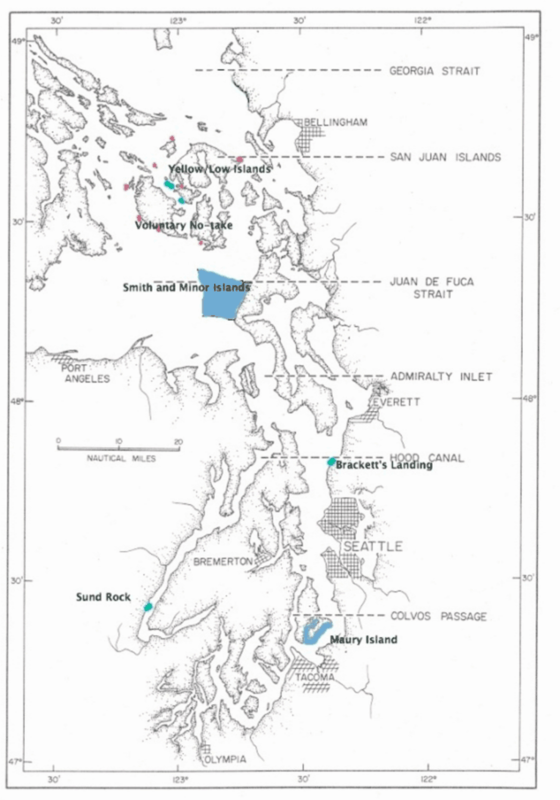 The main forms of Puget Sound MPAs are: no-fishing areas declared by the Washington Department of Fish and Wildlife (WDFW) to improve fish populations and protect habitat (Figure 1), diving/no-fishing reserves spearheaded by SCUBA diving enthusiasts and sanctioned by WDFW (Sund Rock and Brackett’s Landing, Figure 1 and 2), and aquatic reserves declared by WA Department of Natural Resources (WA DNR, Smith and Miner Islands and Maury Island Aquatic Reserves found on Figure 2) to regulate bottomland leasing in critical areas in order to improve marine habitat conditions. The majority of the WDFW MPAs are small and recent in their designation (Table 1). They vary in terms of citizen engagement and frequency of use by recreational SCUBA divers. Conservation Areas are fully protected from non-tribal fishing, whereas Preserves allow for some forms of fishing, usually for salmon with trolling gear (Palsson, pers. comm.). Fifty percent of the sites contain rocky reef habitat utilized by ESA listed rockfish and popular with divers. Some, but not all, of the WDFW MPAs are part of the national MPA system. Murray, MR and Ferguson L. 1998. The Status of Marine Protected Areas. Proceedings of the Puget Sound Research Conference, Seattle, WA. Puget Sound Water Quality Action Team. 1998 pp. 783-793. Osterberg, A. 2012. Developing a Network of Marine Protected Areas in Puget Sound. A Synthesis Report on Challenges, Opportunities and Policy Options. A report prepared for the Puget Sound Partnership under WA Sea Grant Hershman Fellowship program. Van Cleve, FB, G Bargmann, M Culver, and the MPA Work Group. 2009. Marine Protected Areas in Washington: Recommendations of the Marine Protected Areas Work Group to the Washington State Legislature. Washington Department of Fish and Wildlife, Olympia, WA. Whitesell, EH, FW Schroeder and P. Hardison. 2008. Protecting Washington Marine Environments: Tribal Perspectives. Olympia, WA. 43 pp. Unpublished Report.